Saturday I ran the St. Malachi 5 miler for the second time. It’s hard to believe that I haven’t run this race that much before, because it is becoming a favorite. With such a unique distance, I wasn’t sure if I wanted to race it or use it as part of my long run. I decided I’d take it easy and use it as part of my long run. Somehow I was able to convince my friend Elayna to sign up for the race so we could run it together. Because this was her first St. Malachi, I asked her to do a recap to get her perspective on the race. 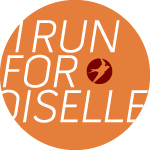 “In a not-so-typical last minute fashion, I agreed to race with Chelsea for the St. Malachi 5-mile. Prior to this, I had gone on a few runs that were between 3-4 miles, but I hadn’t really pushed much more than that. About 20 minutes before I left that morning, I checked the map, and instantly got excited. The race ran through downtown Cleveland, up and around Cleveland Browns Stadium, and finished off in one of my favorite spots—Ohio City. Even though I don’t really enjoy running too much, I really like spending time with Chelsea, so it always ends up being fun…and I feel pretty good when I finish running too! So we hustled down to the Ohio City area, desperately looking for a parking spot. Luckily we had just enough cash to pay for my entry and parking. We ended up having a little warm-up jog, dodging everyone who had finished the two-mile to pick up my race packet, run back to the car, run to the bathroom, and head out for the race. As we approached the start line, it was clear the race had started just a few moments before—so we were off!! I have done 2 races other than Malachi in my life—so I’m not exactly speaking from experience here. But the first mile felt pretty good–it was a lot of weaving before we found a comfortable pace. Chelsea was kind enough to slow down and run with me, which is typically a 10-11mi/mile pace. About a half a mile in, we passed some cute Irish dancers accompanied by traditional Irish music, which picked up the spirits of the whole group of us running down St. Clair. The second mile we felt pretty comfortable, and by the 3rd we spotted one of my husband’s best friends booking it around the stadium on his way around. He paced under a 7mi/mile finish, so he was quite a ways ahead of us at that point. It’s always fun to see a familiar face! The 3rd mile was a bit rough for me; drinking the night before seemed to have caught up, and I started cramping up a bit (from dehydration?) and I had some mild medial ankle pain in both feet. It was nothing worth stopping over, so we kept on trucking, nice and easy. Honestly, there’s nothing like a few long hills to put you in your place. Miles 4-5 both had longer inclines that slowed up more than a few of us, but we kept on going. It ended up being well worth it, because as we plateaued on the Detroit-Superior Bridge, you get this great view of the mouth of Ohio City. The downhill toward the finish is full of fans on the sidewalk, cameras, and echos of the finish-line celebration down closer to the Flats. Chelsea, with all of her wisdom, told me not to run too quickly, but honestly I thought the finish line was much sooner than it ended up being! I found myself wondering, “where the heck is the finish line? !” once the hill bottomed out. We made it eventually, with a little bit steeper of a decline this time, and finished just over 53:00 minutes. It was well worth it. 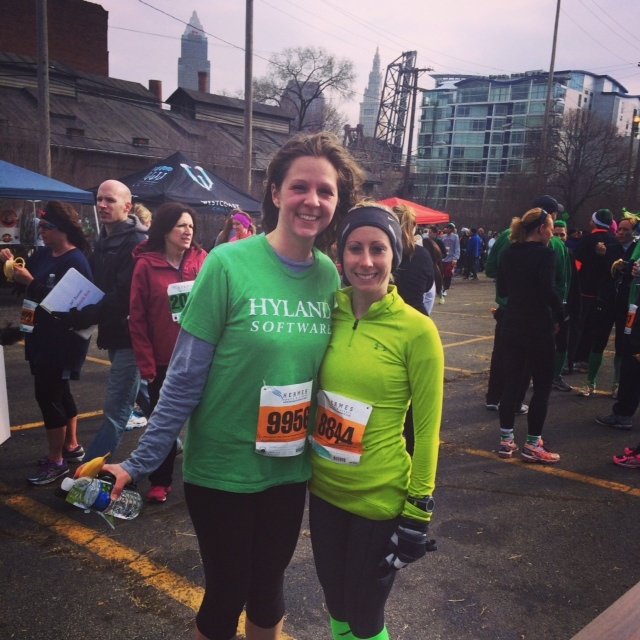 I’d recommend the race to other people who A) want to consider running a little more seriously (there is a 2-mile option), B) want to start off St. Patty’s Day Weekend in Cleveland right, or C) want to explore downtown and the shore way a bit! Nice job! It sounds like a fun race – who doesn’t love a few hills? !